Six young tennis superstars are set to compete in the International Tennis Federation-AGS Junior Tennis Championships, which will be held in Jakarta, Indonesia on from June 24 to July 1. 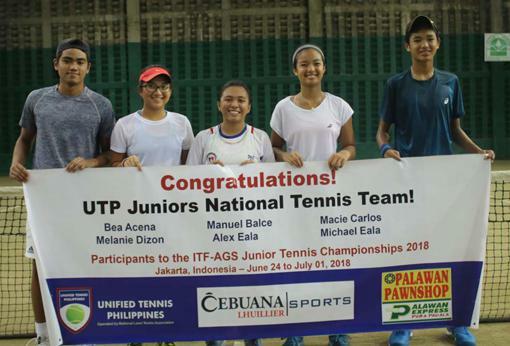 Members of the UTP team, namely Bea Acena, Manuel Balce III, Macie Carlos, Melanie Dizon, Michael Eala and prodigy Alex Eala, are shown here. The young tennis sensations are part of the newly formed national junior tennis team by the Unified Tennis Philippines. The players are Bea Acena, Manuel Balce III, Macie Carlos, Melanie Dizon, Michael Eala and prodigy Alex Eala. The formation of a national junior team is part of UTP’s efforts in developing fresh talents, the national team is set to represent the country in several top tournaments sanctioned by the International Tennis Federation and the Asian Tennis Federation.